I always like to find something new and most working Android phone tips and tricks, and eager to share with you, and Greenify is one of them. Learn how to make Android run 10x Faster & how to hibernate apps, fixing RAM hogging Android apps, how to optimize your Android phone's battery life using Greenify. The Greenify - is an awesome app that could help to save battery and improve Android phone performance. Of course, it’s better than task killers or managers. So stop searching for how to make your android phone faster and learn how to make Android faster without root or with root & especially how to make Android faster and smoother for games. With Greenify, your Android device can also run almost as smooth and lasting as the first day you have it as a fast phone - they claim. 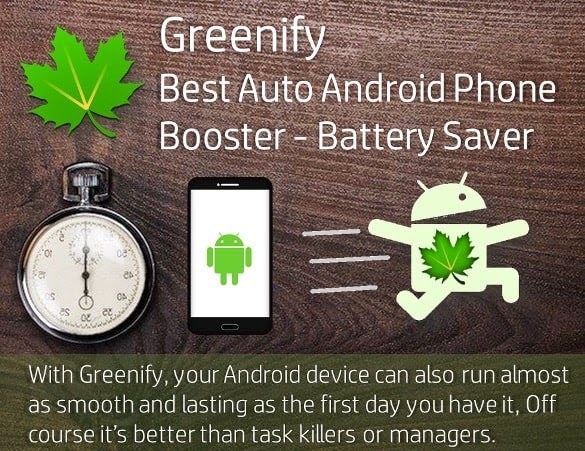 Greenify auto-hibernates apps you're not using to improve battery life that helps to speeds up your Android device by stopping battery hogging apps from running in the background. This supports unrooted phones as well. In last tutorial you might have seen successful solutions on two major issues of ANDROID phones, one is about "Unfortunately, Touchwiz Home Has Stopped" and "On Screen Display Flickering Error By Android". Today we going to see more advanced and effective way to boost Android phone. If your battery won't make it through the day, Greenify is a handy tool that will automatically hibernate [means STOP the process] running apps which are usually battery hogging apps and make you charge battery regularly. It’s the fastest tool that will hibernate all the battery draining apps that run in the background, even when you’re done using them. But how to download Greenify from App store, and solve the phone internet slow problem & keep your Android device running smoothly? Check out. NOTE: It works best on ROOTED & NON-ROOTED devices as well. We noticed that; after using Greenify, the phone does run longer. And if you’re tired of the Android battery running out too early, you might like this best Battery Saver Greenify App. Greenify is not the only app that can improve your device's battery life but also the performance by stopping certain user-defined apps. Earlier the inventors of Greenify made its “Auto Hibernation” features fully accessible to non-rooted phones but not then it’s being used for ROOTED and NON-ROOTED mobile phones. Greenify *ROOT* hibernates apps when they're not in the foreground, and they will only run when you, or another app, launches them. Once you install the app, just list the apps that you want to hibernate as they run in the background. Once you listed all the apps which are not that much important for you, Greenify will then 'AUTO HIBERNATE' that entire list of apps which you are not using them. Open the app, Allow Accessibility. Now in the app, there is a + sign at the upper right corner to add the apps which you want to hibernate automatically. Click on it, and add those apps. Then select DONE [tick mark]. For manual, open app then click >> SLEEP [zzZ] button at bottom right corner. For auto-process: Go to Menu >> Experimental Features >> Select “Working Mode” as “ROOT” or “NON-ROOT” as per your device type. Select “Automated Hibernation” as well. For more info; Greenify uses only 2MB of RAM & nearly zero CPU and battery consumption. Compared to other utility tools designed similar purpose, Greenify gives you the best & the unique experience. Its lightweight and best app ever to keep the mobile phone smooth and faster. Keep in mind that it is not really a task killer. The apps that are hibernating can still be used if you switch to them. When you switch back to them, they will run as if they were never hibernated. Please DO NOT Greenify alarm clock apps, instant messaging apps unless you never rely on them. Please be sure to verify the impact of greenfield apps on which you heavily relies. Greenify just stops them from launching new processes. Once you decide that you want to switch back to a process, it would run as if you never left it.